Today, the final 13 players in a 134-player field returned to battle down to a champion in the 2014 World Series of Poker Event #38: $10,000 Seven-Card Stud Hi-Low Championship. The returning players were some of the best in the world, but after eight levels of play, it was George Danzer who emerged victorious to capture the $352,696 first-place prize and his second WSOP gold bracelet of the summer. It's been an incredible summer for the German Pro. At the end of May he kicked off his 2014 World Series of Poker by placing fifth in Event #5: $10,000 Limit 2-7 Triple Draw Lowball for $70,308, and then a week later he won his first gold bracelet and $294,792 in prize money in the Event #18: $10,000 Seven-Card Razz Championship. Toss in two more cashes, and Danzer jumped out to an early lead in the 2014 WSOP Player of the Year race with 456.20 points, which of course he’ll add to thanks to this win. The first to go was Todd Brunson (13th - $25,569), who fell to John Monnette after failing to make a low, and Alexander Jung (12th - $29,399), who was unable to spin up his short stack, followed him out the door. Ted Forrest, who won his sixth gold bracelet earlier in the summer, exited in 11th place for $29,399, and then ESPN commentator Norman Chad, who had folded in Forrest’s elimination hand in the hopes of moving up the pay ladder, fell in 10th place in the very next hand for $34,500. Moments later Richard Sklar and Monnette would fall to George Danzer in a rare double-elimination hand. Sklar had the shorter stack, so he officially finished in ninth place for $34,550 while Monnette took eighth for $41,277, his finish making him part of the official final table even though he'd never play a hand at it. Meanwhile, Danzer began the final table as the chip leader, which wasn’t unfamiliar territory considering he began the day in that spot. Poker veteran David Singer became the first casualty of the final table, yet another victim of Danzer, and then Chris George followed him out the door in sixth place, though in that hand it was Brian Hastings that did the deed. In Level 24 with the limits at 25,000/50,000 with a 5,00 ante, Jeff Lisandro completed with the and Hastings called showing the . Hastings then called a bet on fourth before raising Lisandro on fifth. Lisandro called and then led out on sixth. Hastings raised, Lisandro three-bet all in for 95,000 total, and Hastings called. Lisandro started with pocket rockets and got his last chips in with two pair, but Hastings had been rolled up with pocket queens. Lisandro was unable to boat up on seventh, and his quest for his sixth bracelet came to an end in fifth place. Despite scoring that elimination, Hastings was the next to go after he was straightened out by Danzer, and then Calvin Anderson failed to survive three-handed play. Danzer began heads-up play with a big chip lead over 2010 WSOP Main Event runner-up John Racener, and he put it to good use by eliminating his opponent on the way to his second bracelet and $352,696 first-place prize. Congratulations to George Danzer, winner of Event #38: $10,000 Seven-Card Stud Hi-Low Championship. 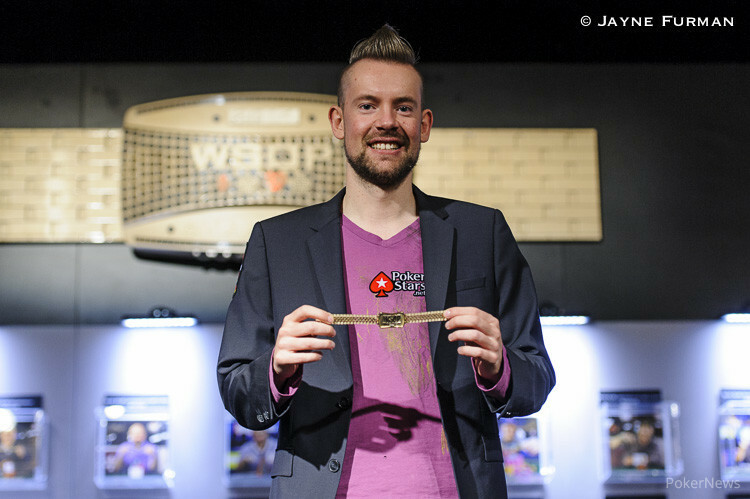 Germany's George Danzer captured his second gold bracelet of the 2014 World Series of Poker. His latest accomplishment took place in Event 38, the $10,000 Seven-Card Stud Hi-Low Championship. He won his other bracelet in Event18, the $10,000 Razz Championship. 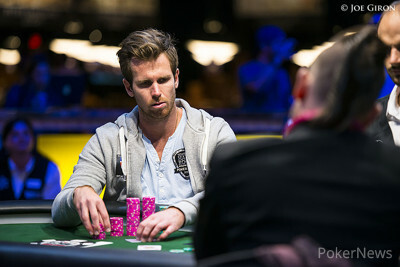 In what would be the final hand of the tournament, John Racener completed with the and George Danzer raised with the . Racener three-bet, Danzer four-bet, and Racener got all in for 275,000. Racener ended up with a pair of queens, but it was no good as Danzer had kings. Racener was denied his first bracelet and must settle for runner-up and a $217,935 consolation prize. George Danzer completed with the and John Racener called with the . Racener then check-called a bet on fourth before leading out on fifth. Danzer called, and then Racener check-called bets on sixth and seventh. Danzer had a straight and the better low which allowed him to scoop the pot. George Danzer completed with the and John Racener raised with the . Danzer three-bet and Racener ended up all in for 335,000. Racener made two pairs and that was good enough to double through Danzer, who wound up with a pair of jacks. George Danzer completed with the and John Racener called with the . Racener then called bets on fourth and fifth before taking the lead on sixth and checking. Danzer bet, Racener called, and the action repeated itself on seventh. Danzer's aces and sevens were good to scoop as Racener sent his cards to the muck. George Danzer completed with the and and John Racener called with the . Danzer then check-called bets on fourth and fifth and then bet when Racener checked sixth. Racener called and then check-called a bet on seventh. Racener had tens and sixes, which was good enough to scoop the pot. How Much Longer Can Racener Survive? George Danzer completed, Racener called, and then Racener check-called a bet on fourth. Racener checked on fifth street and then folded to a Danzer bet. 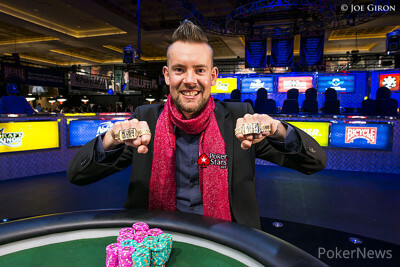 Will George Danzer Win His Second Bracelet of the Summer and Extend His WSOP POY Lead?